Has any one replaced their calipers/Disk while keeping the 16" wheels? What set did you use, looking for Wilwood or Brembo or something like that. There has been some previous information on this site. I know that Sam has Boxster front calipers, and I know some who have Schaffer or Potti's conversions. Only direct experience was a drive in one of Potti's cars. It stopped like hitting a wall! He uses X3 calipers. Not heard from anyone with Wildwood or Brembo but would caution anyone, as I think Felix pointed out, that racing kit generally does not have dust seals appropriate for general road use. Changing the master cylinder and the apportioning pressure valve seem to be recommended for an ideal set up. I did a search, but nothing came up... more likely due to jy search capabilties then what has been discussed. Whichever option you go for, ensure the brackets are balanced and machined correctly. Sam also added some Brembo Bling to my Z1 arches. Lovely shot. But can you quantify the retardation factor of Bling? I've spent a fair amount of time studying brakes and ABS and Bias. While its not rocket science to do the math, I did set up a spread sheet to do quick calculations on what I refer to as the mechanical bias of a chosen set of hardware. The Companies that make brake pads will rarely specify the coefficient of friction for a given pad, and if they do, its usually not going to be given to a standard temperature or pressure. Really, it turns out with study that the Cf needs a 3D graph of data to accurately describe it. My spread sheet does have the Cf incorporated, but I usually keep it equal for front and rear to simplify things, and suggest that unless you're fine tuning a race car to keep the same brand and type of pad both front and rear to avoid problems. What problems do I speak of? Well, its not discussed much in forums, but on old fashion cars without ABS, there was almost universally a bias valve built into the system to insure that under braking, increasing bias to the front took place to account for weight shift, and need for more braking in front, as well as importantly, to avoid locking up the rears and having a spin. If you look at modern cars, they lack this bias valve instead opting for the ABS system to electronic bias control, and read the sensors, quickly shift bias to the front, and prevent that lock up, while maximizing braking ability. This is far superior to almost any race car driver's ability to adjust bias on the fly with an adjustable bias valve. The E30 chassis (including our Z1's) reflects an interesting half-way point for braking as we have both ABS with built in EBD (bias adjustment) AND a mechanical valve. The early engineers were reluctant to abandon completely the safety of the mechanical valve. So, we (Z1) are lucky that we have a back up mechanical bias valve... it protects us somewhat from ABS failure. Nonetheless, I'd be careful and do some math with changes. Why does this matter in a thread on upgrading brakes? Well, the computer's algorithms for calculating bias rely on making a change in proportion to the data they collect, based on expected results from those changes to zero in on the right bias. If we go to far from the original mechanical bias, we have the very real risk of extending our braking distances, even if we've increased our heat soak, and resistance to fade.... because we've stopped using the rear brakes essentially by messing up the bias.... and... ABS is not likely to work as it should as it can't zero in on the right bias because the results of its bias adjustments aren't in line with the original set up's results. A really big problem is creeping up on us in that car designs are moving towards increasing rear mechanical bias to improve a myriad of things like traction control, directional stability etc... and if the ABS fails, you no longer have a "natural" forward favoring mechanical bias OR the mechanical valve in place to avoid those rear wheels from locking up. The mechanical bias is defined by rotor diameter (not thickness), master cylinder diameter(s), caliper piston's diameters and number, radial height of the brake pad, and the Cf of the pads. Radial height of the pad is necessary because it must be used to center where the torque is applied to the rotor at half its height from the edge. The take home might be this. Its easy to increase heat soak and avoid brake fade under duress with BBK that we might put on our cars, but its also very likely that you won't shorten your braking distance, and could possibly make it worse if you don't get the math close to the original mechanical bias. Its not inconceivable that a BBK lengthens the braking distance on the street. As I consider the upgrade in power I'd like to eventually do, I'm also considering discreetly upgrading to the MK60 ABS system. If I did do that, I would try and duplicate the mechanical bias of an E46 M3, not a Z1. THAT change would very likely shorten braking distance and dramatically improve braking in any rain or other slippery conditions. It would require removing the bias valve, as well as conversion to 4 channels of brake line and adding some sensors etc. Lastly, unless they've taken it down, StopTech has excellent White Papers on braking that are very well written. I've spent a fair amount of time on the phone talking to one of the authors, and he was gracious enough to help me understand more about the EBD systems and how we can accidentally mess them up by trying to improve braking. I'm not trying to start a debate here, or rain on anyone's parade, or criticize anyone's choices in what they've done. I'm happy to run numbers for people and discuss results. Baby deliveries by day, baby deliveries by night, Euro motors in between. I did indeed fit Boxster front calipers to my car. It was easy enough really, with care being needed around the bracketry. I had already fitted a 7-series master cylinder to my car and braided hoses. Having tried a number of different pads, I decided to go for Brembo, as it felt as if the calipers were the limiting factor. In so doing, I also went for considerably larges discs, 312mm in fact. Coupled with a 15mm spacer, this can be done within the standard 16" wheels, which was an important factor to me. So I topped this off with simple EBC Red Stuff pads for a bit more friction and less susceptibility to fade. As to the question on retardation: Essentially, these brakes, when applied hard are akin to hitting something. It is as simple as that! They are astounding. I run a 2008 Boxster as an everday car and I would say the Z1 brakes feel more effective. 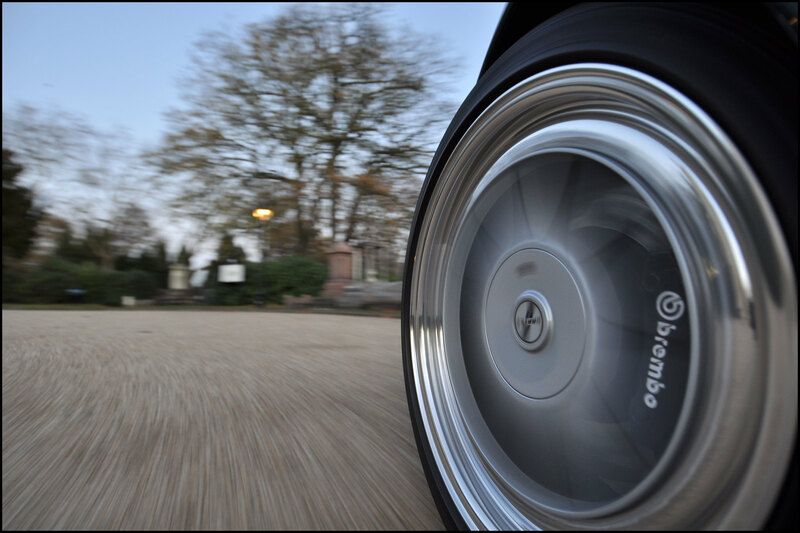 Problems: A tendency to wheel wobble on light braking applications, but nothing more than an irritation. Harder stops are just as amazing as they ever were. Small stones can get trapped between the outer face of the caliper and the inner face of the wheel, but these soon clear. I did nothing with the front/rear apportioning valve, contrary to generally accepted guidance and my brakes have never felt unstable. Seriously though, the brakes on the Z1 were never that good in my opinion and now mine are vivid. I drive the combination of a 294mm disc in front and the stock Z1 disc on the rear axle with the 16" wheels. Many years ago I had great concerns when modifying fast cars to be extremely faster than what they were designed for. My main concerns were braking, balance and bias levels. Although I appreciate the detail of the article above, and I do understand the theory, in the real world, I and many many people have put BBK’s on the front (only!) of our cars, in my case, among others I have owned, a mid engined car designed and produced with 250 BHP modified to 400-500 BHP. On said cars I did not fit a bias valve, I did not change the rear brake or ABS set up in any way. I did use much larger front discs and much larger calipers. In fact I went from one piston to six! I can categorically state that the brakes were phenomenal on road,on track, from cold and when hot and never suffered from fade. Also the car never tried to swap ends. In my experience, the correct selection of pads is critical to the style of driving and temperature of your particular environment and for most applications, a good place to start and in some cases, all you need to do. This is the case in the MR2 Cup racing series where a set of Carbotec pads are used to great effect.